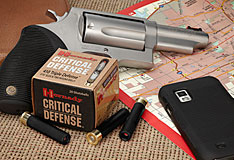 Hornady Critical Defense 410 Ga 2 1/2"
Delivering effective shot patterns that place all projectiles on a man-sized target at seven yards, the Critical Defense® 410 features a unique Triple Defense™ projectile stack consisting of two 35 caliber round balls topped with one non-jacketed FTX® slug. Unique to the Critical Defense 410, the 41 caliber FTX® slug actually engages the gun's rifling, and contacts the target nose-on, enabling the patented Hornady Flex Tip® technology to assist in expansion for greatly enhanced terminal performance. Each 35 caliber round ball is made of high antimony, cold swaged lead to resist deformation and provide excellent penetration. The 410 Critical Defense is loaded to 750 fps at the muzzle with 294 ft lbs of energy. Flex Tip technology assists in expanding the slug for enhanced terminal performance and the round balls penetrate the target at 7 yards.